The July 2014 edition of the Ranking Web of World Repositories brought good news. ORBilu has shown great progress in terms of the ranking. Since July 2013, after only 1 year, ORBilu has moved up 473 places in the global academic repository ranking to 519th out of 1 897 repositories in total! The 22nd of April 2013 saw the official launch of ORBilu, the UL’s Open Repository and Bibliography. It marks the date that the UL decided to make its academic research available to everyone, without barriers: legal, financial or technical. Click to see the details of what 1 year of ORBilu has added to your visibility! Need help with your copyright transfer agreement? Fed up with not understanding that copyright transfer agreement you have to sign before you submit your article for publication? Want to keep the rights to your research? Did you know that the ORBilu team can help? Our experience with copyright agreements means that we can help you determine what your rights are and, most importantly, how you can try to keep them! We can also call upon a copyright expert in Luxembourg to ensure that what you are signing is not detrimental to you and the future use of your research. Already signed an agreement and don't really know what you signed? Planning to sign an agreement in the next few weeks? Send it to us and we will decipher for you the main points pertaining to copyright and what you can (or cannot) do with your publication. Interested? Contact us now on orbilu@uni.lu. Already available during the import process, ORBilu now incorporates duplicate checking during the data entry process as well. You want to add a publication where the title, first author and date published match another entry in ORBilu? ORBilu will provide you with a warning and ask you to verify if it really is a duplicate or not. See how this functionality works in our training videos. The Luxembourg Portal for Innovation and Research has just released its redesigned pages promoting the scientific publications of Luxembourg's research organisations. Now, the latest publications for the University of Luxembourg as well as each Faculty and Interdisciplinary Centre are automatically displayed from ORBilu. 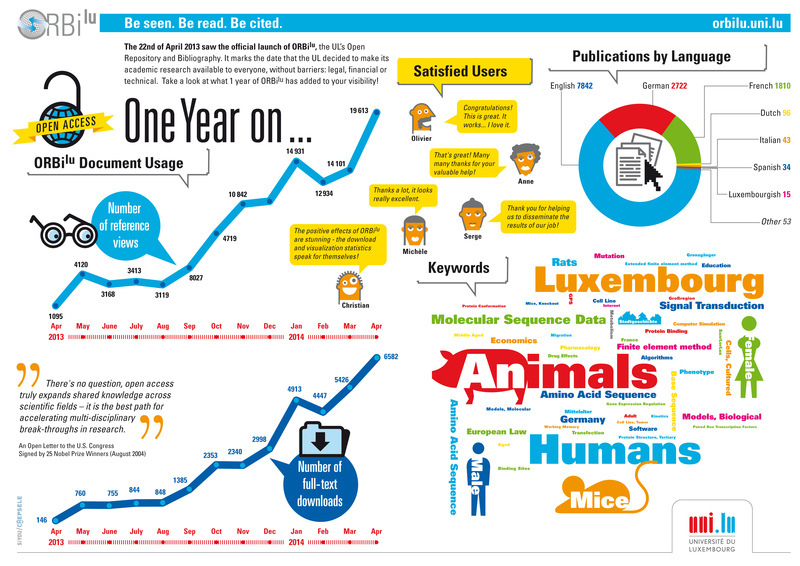 The full announcement and link to the site are available on http://www.innovation.public.lu/en/actualites/2014/03/publi-scientifiques/index.html. What is MyORBilu? 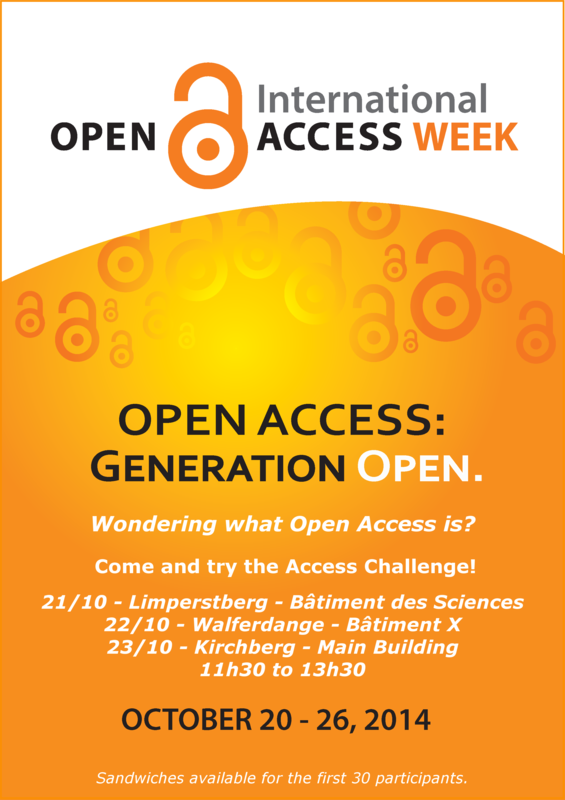 How can I check my journal's Open Access policy? What are the different access types for documents in ORBilu and how can I use the Advanced Search? These are just some of the questions that the new online training videos, available from the Training Sessions page, propose to answer. An FAQ and a Glossary. The ORBilu Team is pleased to inform you that the doctoral theses defended between 2006 and 2013 have now been added to ORBilu. They are available for consultation here: University of Luxembourg Doctoral Theses. As of January 2014, the University of Luxembourg has also strengthened its mandate by requiring doctoral students to enter the details of their thesis in ORBilu in order for them to receive their diploma. The addition of the full-text remains at the discretion of the doctoral student. New ORBilu training schedule now available! The new training schedule for ORBilu is now available. Click here to register. Horizon 2020 and Open Access - deposit in ORBilu meets the requirements! "Open access to scientific peer reviewed publications has been anchored as an underlying principle in the Horizon 2020 Regulation and the Rules of Participation [...]" So states the Horizon 2020 (H2020) Open Access Fact Sheet. Thus, any research receiving funding from H2020 will be required to publish in Open Access. What does this mean? Do you need to pay to publish? NO! The EC supports both the green road and gold road to Open Access and therefore, by depositing your publication in ORBilu, and making your full-text document available on Open Access within 6 months of publication (12 months for social sciences and humanities), you will fully comply with the requirements of your grant. And, if you link your publication to your H2020 project (as you did for your FP7 projects), your publication will automatically appear in the OpenAIRE portal, the EC's portal for Open Access publications linked to their funding programs. In a very innovative move, the EC has also launched a pilot to open up access to publicly funded research data. The full press release is available here.